I've spent the past few months looking at DC's newest version of the "Greatest Stories Ever Told" trades, which sought to collect the best and the brightest of DC's most iconic characters. As far as iconic goes, though, you could do worse than Paul Dini and Alex Ross, the creative team behind The World's Greatest Super-Heroes, which collects the pair's six oversized graphic novels on top DC characters facing real-world problems. While The World's Greatest Super-Heroes isn't a part of the twelve-book "Greatest Stories" series proper, both projects seem similar -- collect in one volume a snapshot of the characters that encapsulates the heart of who they are and why they're heroes. The latter is especially significant; aside from fleeting references, there's not a super-villain in the whole book. Instead, each tale finds a hero faced with an everyday threat like hunger or poverty or just loneliness; these are stories, beautifully rendered by Ross's photorealistic paints, that recall the Norman Rockwell-esque "day in the life" chapters of Geoff Johns's JSA, catching the heroes on their more low-key days and positing interpretations so down-to-earth that they'd fit right at home in the hyper-realist Nolanverse. The style of each is the same, with the stories functioning more like picture books than comics. Panel divisions are subtle and infrequent, allowing Dini's internal monologues to meander over Ross's lush artwork. It's not inconceivable to picture reading this book to a child before bedtime, and indeed some day I plan to do precisely that. Even for adults, though, there is much to enjoy in this surprisingly earnest and delightfully iconic book. How else do you begin? One of my most treasured Christmas presents many years ago, Peace on Earth finds Superman recognizing the disparity between Christmas as a time of giving and the world as a place of great need. With the means to feed the entire world, Superman sets out to end world hunger. Tragically, it's a story that we know is doomed to failure, for the same reasons that Superman could only arrest Hitler and Stalin "out of continuity" in the pages of Look magazine. But it's also a familiar storyline, since we've seen Superman wrestle with his inability to do everything almost since his origin. What makes the story succeed isn't any originality of purpose but rather the compelling and earnest narration Dini writes for Superman; the prose passages which pepper Ross's paintings strike a proper balance between godlike Superman and humble Clark Kent, and we feel his shortcomings just as tangibly as we revel in his triumphs. The book is filled with new classic moments like Superman's descent from the sky with a Christmas tree balanced on his shoulder, and it's to Dini and Ross's credit that these moments never feel campy or anything less than genuine. Peace on Earth succeeds further by reminding us that the value of a superhero lies not in what he does but in what he motivates us to do; Superman's Christmas gift to us, in line with Grant Morrison's concept of Superman as the Ideal Man, is the example he sets. If I had to list my top ten Batman stories from any medium, much of that list would include works authored by Paul Dini. Although I love Christopher Nolan's "Dark Knight Trilogy" to death, Dini's work with the character (both on television and in the comics) seems to touch something closer to the character's central nature, with every story being recognizable Batman-fare. War on Crime is a quintessential distillation of what I believe is the heart of Batman -- the pain of loss and the determination to prevent others from feeling that loss (as distinct from, say, Nolan's interpretation of Batman as a symbol to inspire positive change). Aside from one-panel cameos from Alfred and The Penguin, Batman is the only recognizable face in this story, and his narration anchors the story in a voice which is clearly pained but with grim optimism coloring his action. Dini wisely keeps the action small, with Batman struggling against local crime and waging a battle for a young boy's soul in the process; it's a story that works well because of how uncompromisingly good Batman's quest is as he pauses mid-battle to offer a kind word of encouragement to a young man who has also lost his parents to gun violence. Alex Ross makes expert use of the shadows here, judiciously deploying streams of light to accentuate the hopefulness which is inherent in Batman's mission. Ross's photorealistic shadow play matches perfectly the tone of Dini's script, but Ross also does great work with Bruce Wayne out of the costume, making Bruce Wayne as much of a commanding presence as his cape-and-cowled alter ego. At first, the writing in this story seems odd, overly enthusiastic with too much gee-whiz for my tastes. But when a full-page splash reveals that the story is narrated by Billy Batson and not Captain Marvel (the hero currently known in the New 52 as the somewhat more cynical Shazam! ), Paul Dini reveals that he's playing with narrative voice in a way the series hadn't seen before. And it's to great effect; the childlike exuberance of Captain Marvel's narration gives the story more weight when Captain Marvel volunteers at a children's hospital to restore hope. It's a story that probably wouldn't work were it not for Dini reminding us that Captain Marvel is still essentially a child. Surprisingly, and to the story's credit, Alex Ross creates a Captain Marvel that is leaps-and-bounds more approachable than his Kingdom Come rendition of the character. His heavy eyebrows and wide grin carry none of the malice of brainwashed alternate future, instead posing like a child in front of a mirror after a muscle man marathon. Billy, however, sometimes looks too old, which takes some of the thunder (no pun intended) out of the shift in identity. The transformation scenes are staggering, however, and it's difficult not to feel a tugged heartstring or two when Captain Marvel realizes that he can't save everyone but can share the gift of hope with all. The fourth Paul Dini/Alex Ross pairing is somewhat stronger than the Captain Marvel one, in part because Wonder Woman's a more potent character with a clearer mission. Her role as "ambassador to man's world" has sometimes been a nebulous one, but Dini takes full advantage of it with Diana as a kind of goodwill tourist, assessing the world's problems from the vantage point of the disadvantaged. The character's compassion and dedication to the powers of good are so compelling that it's almost a disappointment when Clark Kent shows up, as if to say that Wonder Woman can't carry a story on her own. It's entirely untrue; her quest is more intriguing and more realistic than most in the book, and Ross's artwork steps up to match. His Wonder Woman is beautiful and majestic, the scenery striking, and her goals for humanity attainable. While I'm impressed with the "daughter of mythology" approach that Brian Azzarello and Cliff Chiang are bringing to the New 52 incarnation of the character, I didn't realize how attached I was to this version of Wonder Woman, and I'm glad to have such a nutshell encapsulation delivered by such able creators. 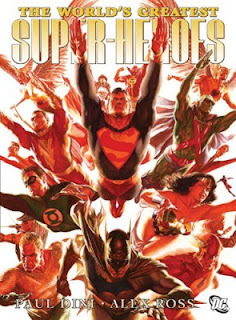 It's a bit difficult to review this chapter as a separate entity, since it's equal parts warm-up for Liberty and Justice and two-page origins for the characters who didn't get their own solo books: The Flash, Green Lantern, Aquaman, Martian Manhunter, Green Arrow, Hawkman, The Atom, and Plastic Man, as well as a few second-stringers lumped in on a JLA origin page. They're concise and effective, but none is truly distinctive, aside from the Plastic Man page which plays with voice in the same way that Power of Hope did. That these are not distinctive is not a knock on the quality, however, but the Dini/Ross team has been turning in consistently good work throughout this volume, and Secret Origins is no exception. Surprisingly, and unfortunately, Liberty and Justice is the one book in this volume that never really works. In part, it's because the format is substantially different from the others; instead of relying on the interaction between narration and silent panels, Liberty and Justice is structured much more classically, with traditional speech bubbles competing with the narration boxes for attention. The result is that it's harder to focus on Alex Ross's gorgeous artwork; after a whole book of his work, I was eager to see his Justice League in full force, but too many overfull panels prevent the full effect from being felt. What's more, we know that a Justice League needs a large threat to combat. What we get here is an odd plague which seems sinister and extraterrestrial but which disappointingly never manifests itself as anything more than a stubborn space flu. We don't, for example, get the Starro combat promised by the back cover; instead, it seems that the League is called in, overreacts, and then moralizes about their actions to a hostile United Nations. There are plenty of wonderful moments, as when Superman saves a suicidal jumper (anyone who knows me knows I'm a sucker for these kinds of moments, as in All-Star Superman or Young Justice), and it's not that the story is a dull read. But it's a disappointing note on which to end the book, two great creators who are turning work that is somewhat less than. The World's Greatest Super-Heroes is padded out with pages from Alex Ross's sketchbook, most interesting when it details his process of photo referencing with shots of his models, and the book concludes with a few luscious gatefolds that this collector was too timid to tear out. It's a delightful package, a fantastic coffee table book on the order of Ross's Mythology, and despite its anticlimactic ending, it's a wonderful read. I had purchased this book when the word "Flashpoint" was just another teaser word that signified another crossover I probably couldn't afford. But now that we're more than a year into the New 52, it's difficult to read this trade without your glasses seeming a little rosier. Love it or leave it, this interpretation of these characters is a thing of the past, and I can think of no better send-off than The World's Greatest Super-Heroes, a loving tribute by two master craftsmen. This concludes the "Greatest Stories" series, but fear not -- I'll be back with more Criminal reviews and more very soon. Thanks as always to our gracious host and to the readers who've been following along! More Greatest Stories reviews: Superman Vol. 1 and Vol. 2, Batman Vol. 1 and Vol. 2, Wonder Woman, Green Lantern, Flash, Justice League, Shazam, Batgirl, Superman/Batman, and Joker. I think, by far, the finest is the Superman story. It couldn't have ended in any other way, but feels too genuine. Spot on. I think this book is out of print, which is criminal. Not living in the US, I have no idea how easily it is available there. Is there also available now any oversized edition (afaik the newer - from 2010 - paperback is available only in stnadard size (?) ) or the oversized was only the - in 2005 issued - hardcover edition (now unavailable except for ebay)?